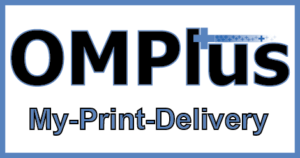 OM Plus My-Print-Delivery (MPD) pull-print software is Plus Technologies solution for pull printing. This pull-print solution is also know by other names. Names such as: print release, pull-print, follow-me, or find-me printing. The idea behind the concept is to improve printing efficiencies by holding user documents in the print system until the user releases the document while physically at the printer or multifunction device itself. There are many benefits for implementing OM Plus MPD such as: saving pages printed, reducing toner consumption and cost, and increasing document security. Pull-print works by allowing the user to print documents through their usual print experience. Thus there is no change to the user. The document is routed to OM Plus My-Print-Delivery (MPD) where the job is held in OM Plus. When the user is ready to print they go to the device of their choice, swipe their card, pass authentication, and then MPD routes the job to the printer. This process ensures no print jobs/documents are left unattended. Confidentiality and Compliance: The risk of printed documents left in the output bin is minimized as the users will be directly at the device. Mobility: Users can move from one location to another and still print without having the need to log onto a computer. Cost: MPD can reduce print volumes by 15%-20% lower usage of expensive toner. Green: Less paper and less toner are consumed. Security: Users are authenticated and only see their jobs. Please contact Plus Technologies for more information. The ROI for print control was very strong and the actual OM Plus results proved to be exactly as planned. Western & Southern Life.